I'm one of those people who owns 10 bottles of body lotion and will only ever use them every so often however recently I've been really good and have continuously been switching between two and using them at least once a day. 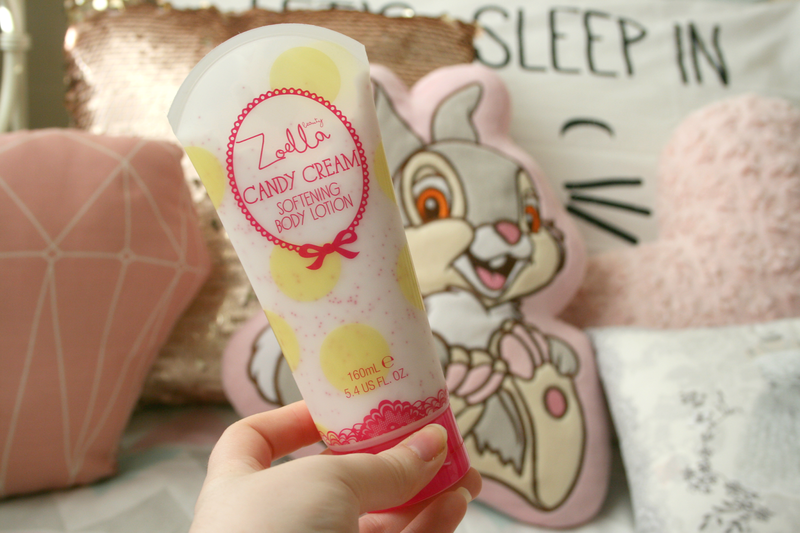 One of those body creams is of course the Candy Cream from the Zoella Beauty range. I am an absolute sucker for pretty packaging but honestly who isn't!? I bought this back in August knowing I had so many body creams that I had yet to use but the packaging was just too cute to not buy it. However I have been good and have been using it at least every second day for the past month and every now and then before. Firstly the packaging, other than it being absolutely adorable I really like when body lotions are in bottles as I find them much easier to use. When they're in tubs I just find it way too messy and so don't really tend to use them after a week. The product itself smells really nice, it's very subtle but still leaves a nice little sweet fragrance. It takes a little longer to dry than others I've tried, but that doesn't really bother me all that much as it leaves my skin feeling so soft. It also contains little pink beads inside the lotion that 'burst' when you rub them into your skin. Containing extracts of Acai and Blueberry to pamper your skin it really is a lovely body cream to have in your collection. For €7.05/£5.00 it's a perfect little stocking filler for anyone who likes to pamper themselves! I am loving the picture and the Disney rabbit in the background ( I forgot his name? tut !) ! I do think Zoella collection is very cute and smell really nice but I don't think they are for me. We don't have any of Zoe's products where I live, so clearly I haven't tried them) though I want to si much, a lot if bloggers say in their posts how good the products are!